Back in the good old days, Microscale, now Superscale, produced sheets with multiple aircraft types on them. In particular, they did sheets on various US Navy Air Wings. This one is on Air Wing 6 and pretty well seems to be from the late 1950s, though no dates are given. Both aircraft are in the light gull grey and white scheme that was on Navy planes for 30 years. The recommended kits are Airfix for the Skyray and Hasegawa for the Cougar. First the FORD (F4D). This one is from VF-162, which later went on to the Crusader and then disappeared after the Vietnam war. The nose and anti-glare panel are in dark gull grey, a peculiarity of Skyrays. The other is a F9F-8 Cougar with VA-66. One wouldn't normally associate the Cougar with an attack squadron, but there you are. 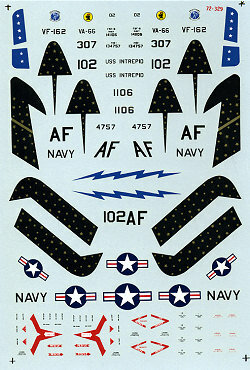 The decal sheet has data markings for both and insignia for one. There are six national insignia, which is a tad odd as you can't do both planes with only six. There is also a larger insignia, but no mate for it, a medium sized one in its place. No mention of this is provided on the markings guide, so I'm at a loss as to why that was done. In fact, the guide doesn't tell you which insignia to use on which plane. I have used the VF-162 markings many, many, many.....well, a long time ago. Do be very careful with setting solutions as the gold doesn't really like them.